Q. My tenant did not pay this month’s rent. What do I do now? The short answer: Serve a notice to end the tenancy. But be very careful of the time lines, or as you will see below, you may not be able to evict this tenant on the first try. First, though, consider how an ounce of prevention could help a landlord avoid this situation. It is not uncommon for a tenant to stop paying rent, or to pay late. Why wouldn’t they, when the laws provide them a “grace” period before the landlord can proceed to an eviction? In fact, some tenants make it a profession to live rent-free. However, a landlord may reduce the likelihood or avoid the situation altogether with some foresight. Tenant Verification Service is a credit reporting agency, and through TVS, landlords can report a tenant’s pay habits. A landlord can provide each new tenant with the Notice to Tenant form available at TVS, which explains that the tenant’s pay habits will be reported to a credit reporting agency on the 3rd day of each month. This provides both a carrot and a stick. Good tenants will benefit from the payment history report, which can be documented and verified in a Certificate of Satisfactory Tenancy, while the not-so-good tenants will take their obligation to the landlord more seriously if they know it could hurt their chances of renting in the future. See Report Tenant Pay Habits on the TVS website for more information. If you have a tenant who does not pay rent for a property in a province that allows eviction in that case, you must serve the delinquent tenant a notice to terminate the tenancy before the end of the term following your province’s rules. Please note that, generally, the rules require that a landlord must wait until the rent is officially late before proceeding with a notice. For instance, in Ontario and B.C, if the rent was due on the 1st of the month and not paid, a landlord must wait until the 2nd – the day following the date rent is due to serve the notice. Other provinces may require a longer waiting period. 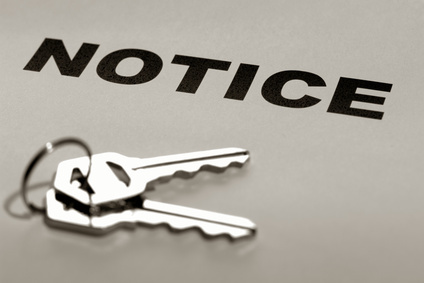 If a landlord does not follow these notice rules to the letter, they run the risk of having the case thrown out. That means starting over again by re-serving the notice, and waiting through another grace period before pursuing an eviction. No matter which time line you must follow for an eviction, a landlord can report delinquent tenants to a credit reporting agency on Day 3, and take control of the situation. Next post: What Should I Do When My Best Applicants Have Pets?